The Rev. 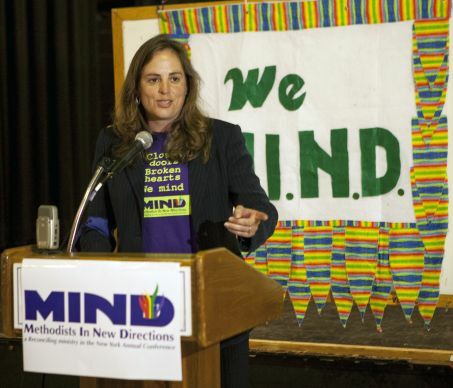 Sara Thompson Tweedy speaks at a Methodist In New Directions event in 2013. MIND is an unofficial group in the New York Annual (regional) Conference that advocates for greater inclusion of gay, lesbian, bisexual and transgender individuals. In March 2103, an official complaint was filed against Tweedy accusing her of being a “self-avowed practicing homosexual,” a chargeable offense under the denomination’s Book of Discipline. Last October, Bishop Martin McLee referred the case to a counsel for the church, roughly the equivalent of a prosecutor, for investigation. Last week, Tweedy received a letter from McLee telling her the complaint has been dismissed.